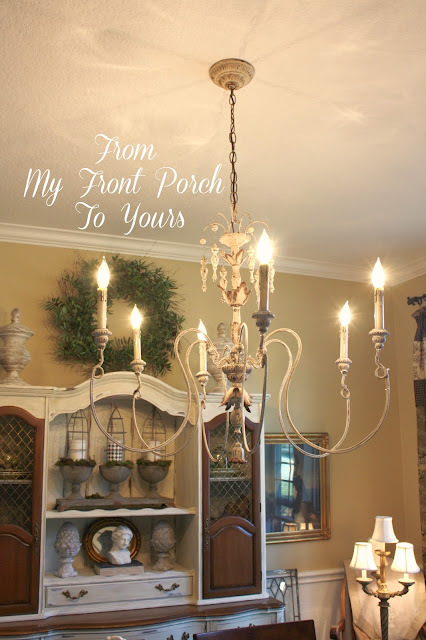 A few weeks back The Hubster and I installed our new yard sale chandy. I really liked it but I was not quite in love with it in our space. To me it was missing something. Something that would make it flow better with our decor. 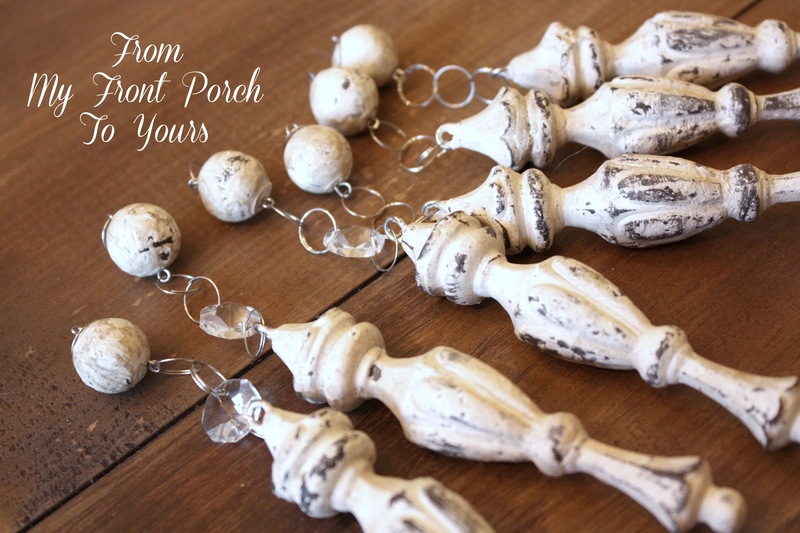 I researched chandy bling and ordered some. I was afraid that they would not look as beautiful in person as they were in the listing picture. You can pretty much make anything look amazing in pictures with the right editing! ;) To my surprise though they were even more beautiful. They are made from glass and not plastic so they have extra sparkle. I got 12ft for just $24.50 with free shipping. A pretty good deal I think. The first thing I did was to swag the crystals around the entire chandy. After adding swags around the chandy I decided to add a crystal to each tassel to ensure that it all tied together. I wanted the new bling to look original to the chandy. 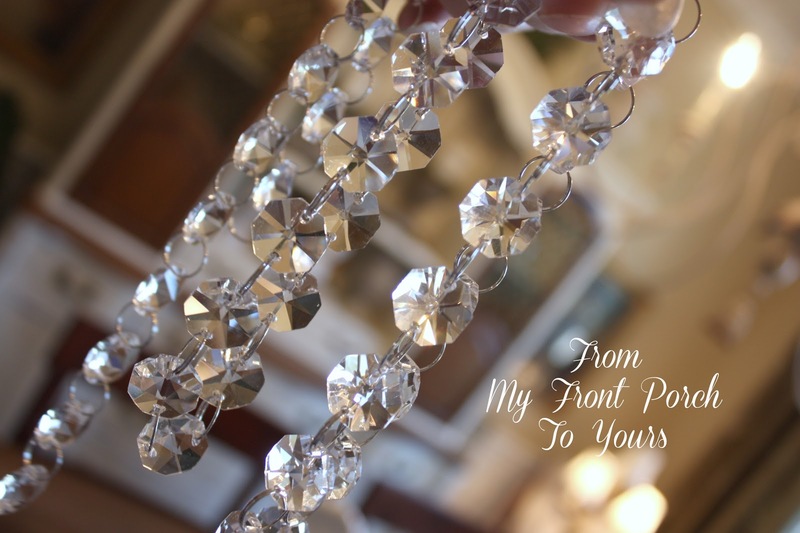 To help ensure this I made sure to order crystals that had the same silver loop as what was already on the chandy. After all the bling was added I decided to add some gold accent by highlighting the candelabra holders as well as the leaf detail with some Rub N Buff. Now the beautiful chandy is even more beautiful and ties in perfectly with our space. And because I could not take pics of the new chandy bling without sharing the first signs of spring in our home here are the spring touches I added to the dining room. 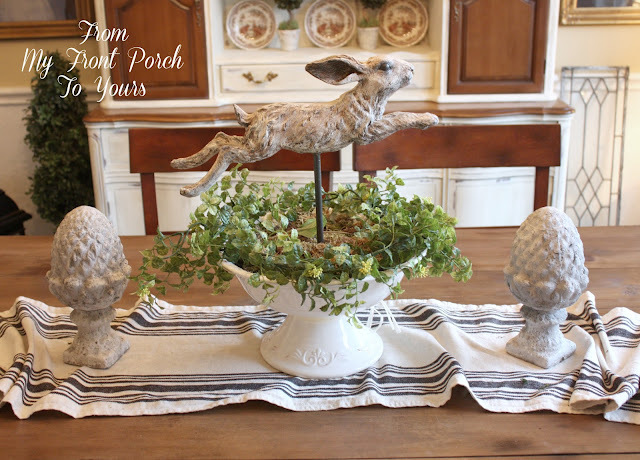 I made this bunny centerpiece last year and instead of coming up with something new I decided to use it again. We did not have the hutch this time last year so I enjoyed decorating it for spring. 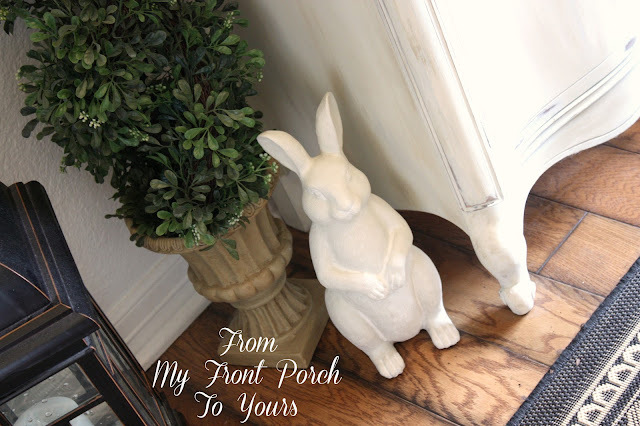 My favorite bunny bowls I purchased from HomeGoods back in the fall. I decided to show y'all the side of the dining room you never really see but it is the first thing you see when you walk in our front door. I love my federal mirror collection even if it is small. I am now saving up for new dining chairs. I want to put the ones on the ends back in the office. I am thinking maybe some wing back chairs with slipcovers and then two frenchy oval back chairs for the side by the hutch. Thanx for stopping by and I hope your week was a good one! So pretty, you've outdone yourself! Such a gorgeous room!!! Beautiful chandy, beautiful room!...Look forward to the additions you planning on for the room!..The chairs sound great!...Have a wonderful weekend! 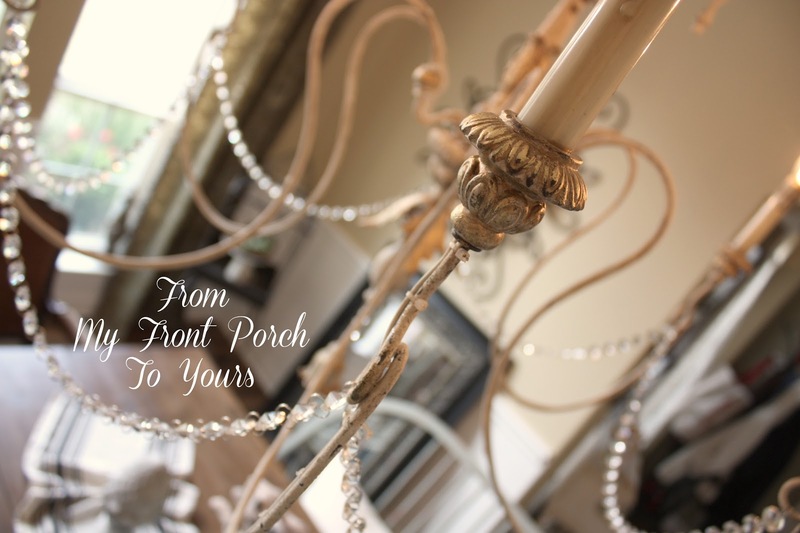 love your beautiful chandy with the bling. This is such a pretty room, Pamela. your idea on the chairs sound wonderful! Oh it is so pretty with the bling you added. Really a unique chandy. That was a great treasure to find. Pamela the chandy looks great with a little bling and I love the "spring" touches you added to your hutch, so pretty!! The whole room looks beautiful! Love what you did with the chandelier! 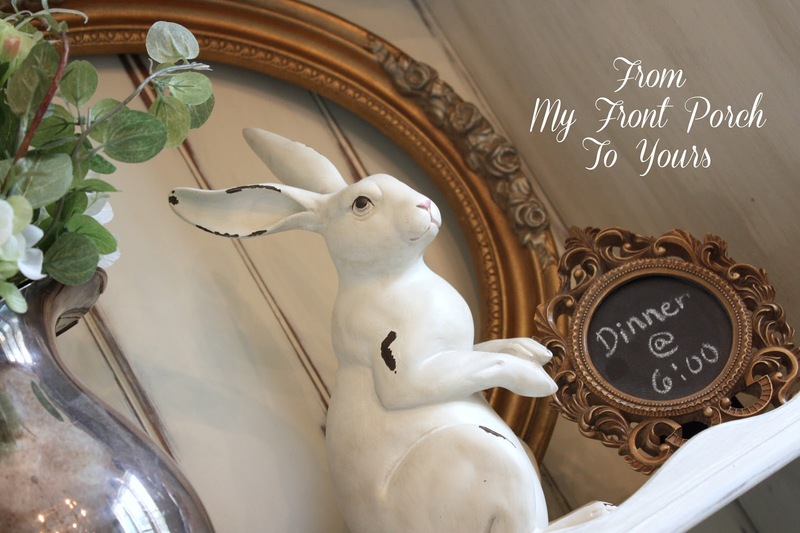 And especially love your jumping rabbit on the table. Beautifully done! You did not disappoint! My goodness, it looks fabulous! And the bunnies are just perfect. Makes me want to sprinkle a few here and there, although my children would probably think they were real and knock them over and...well...I digress. 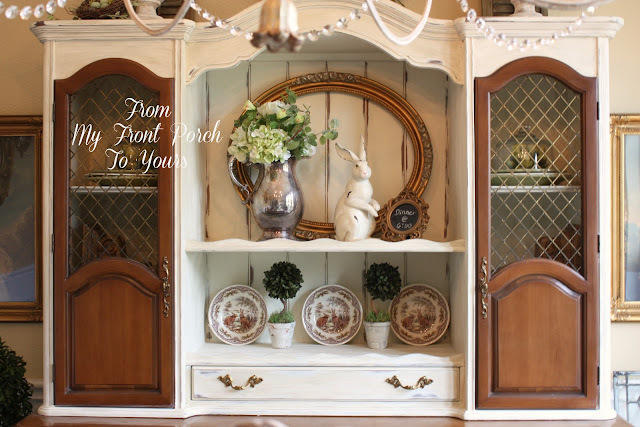 The chandy and the hutch are so gorgeous. Lovin' the white bunnies too. It looks gorgeous! 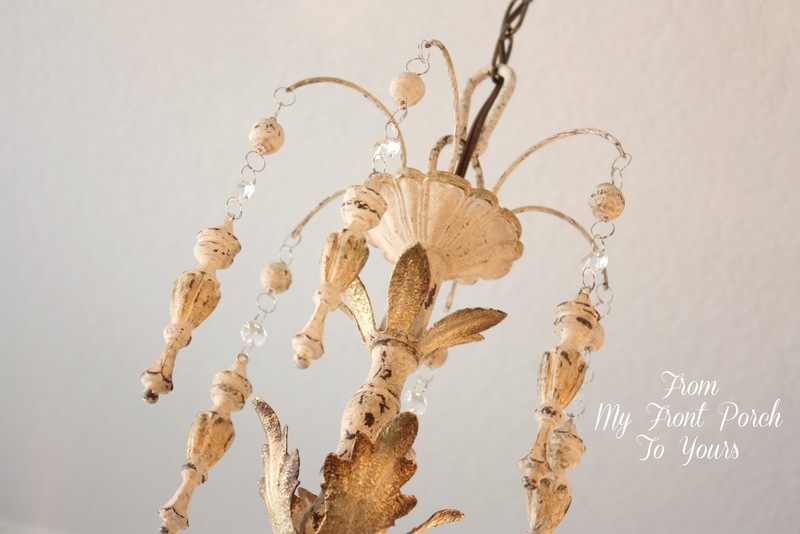 What a beautiful way to dress up your chandelier. 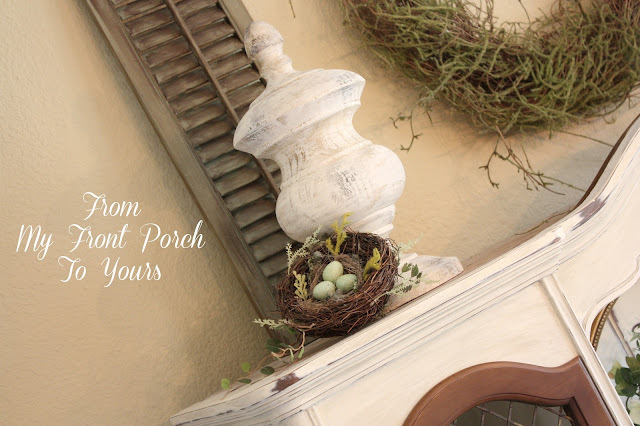 Love, love all your Spring decorations. So pretty! Oh my where do I begin? I adore your entire dining room! The chandy is fabulous - I have ordered bling on line as well, and it so much fun to bring on some sparkle! Such a great post! Hope you can stop by the enchanted oven to say hi. 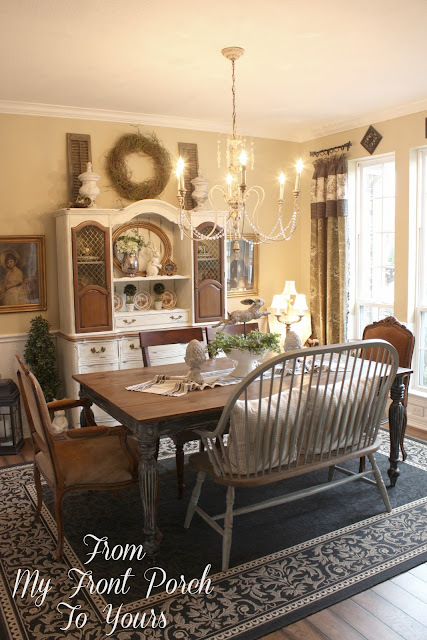 Pamela, EVERYTHING in your dining room is GORGEOUS!!! So many pretty spring things to see. You really have a decorator's eye!! Your chandy is fabulous and the added touches take it over-the-top! 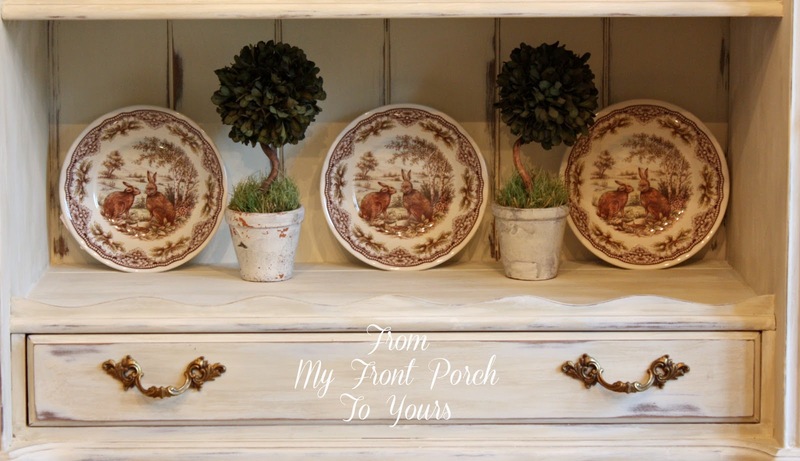 It's absolutely perfect for your dining room. I love the added bling and tassels! Pamela, my goodness your whole room is just fabulous!!! Love the warm feel of everything working together. Can't believe the candy is a yard sale find!! Looks gorgeous!!! Very pretty, Pamela! 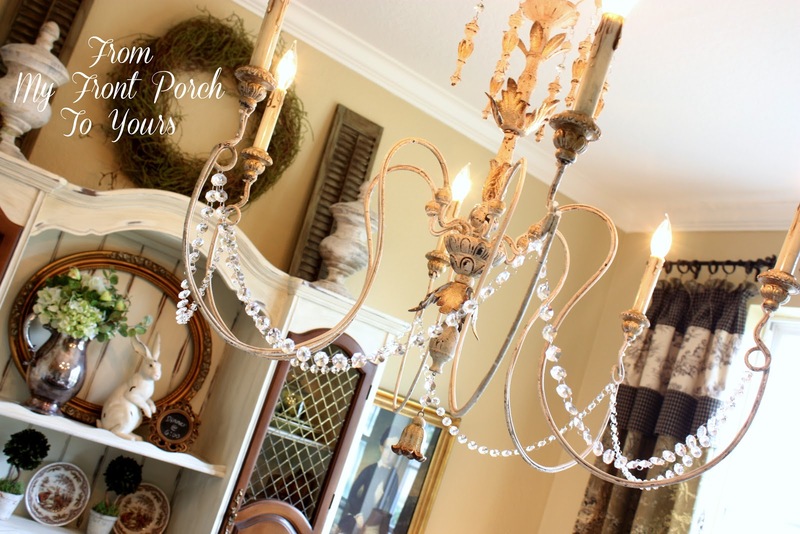 The added bling just enhances the beauty of your chandy. Love all your bunnies, too. I'm still mad my Home Goods didn't have those plates! Pamela...I enjoyed this post. 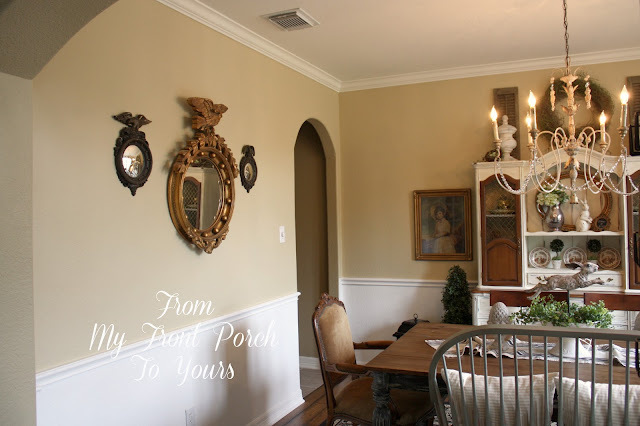 The light fixture is beautiful and goes so well with all the dining decor. 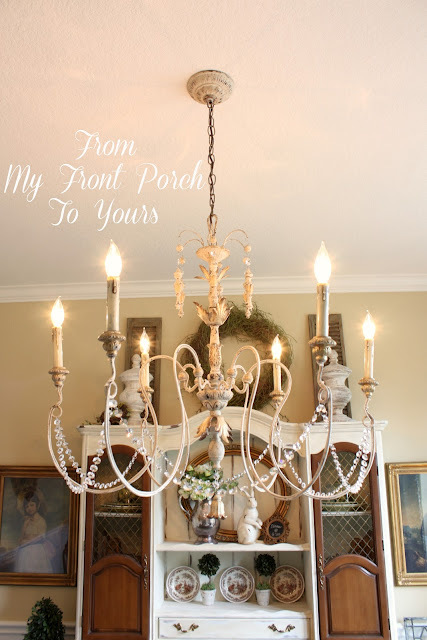 The chandy looks so very beautiful. Love how you made it with some bling. What a great find Pamela. 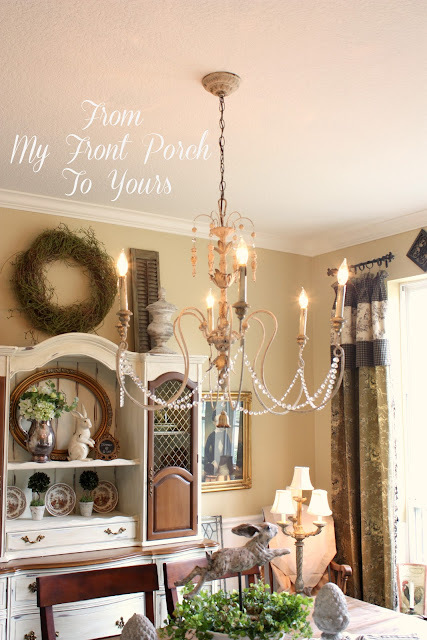 That chandy is gorgeous and what a warm and cozy room. It is beautful. Thank you for hosting and have a great weekend. I absolutely love how your room looks. I can't believe you got the string of glass Crystals for such a low price. I am buying some too! Looks beautiful, Pamela! I love your idea of wing back chairs! Is there a trick to picking out good quality silk flowers/topiaries? Is there a certain material/texture that I should look for? Hi Melanie! I try to stay away from ones look like shiny plastic as far as topiaries go. As for the flowers just go with with your gut instinct. If you think they look real then I say go for it. I tend to purchase mine from either HobbyLobby or HomeGoods.